The gospel of Mark leads us into the most sharply focused narrative of Jesus. 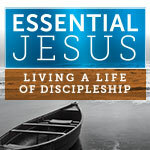 Cutting to the essentials of following Christ and living a life of true discipleship. Pastor Philip walks us through this bold story in a systematic way helping us grasp and hold onto the essential Jesus.